A few years back when I was editing a luxury supplement I realised that in the luxury brands face a two-pronged problem – one, there are certain myths based on which billions of dollars are invested by luxury brands, every year, and two, the existing literature instead of simplifying how best to make the most of the opportunities in the market have chosen to make it more mysterious and rather superficial. It refused to delve deeper and explore the various facets of luxury, making it impossible for brands to actually understand it well and make moolah. The literature was limited to mere cataloguing luxury products. There was an urgent need to narrate a tale of luxe — capturing this wonderful dazzle in a holistic way, unveiling its various facets. My columns have been a great avenue for narrating the untold luxury story. However, through my columns I was not able to paint a holistic, all-encompassing picture of luxe. 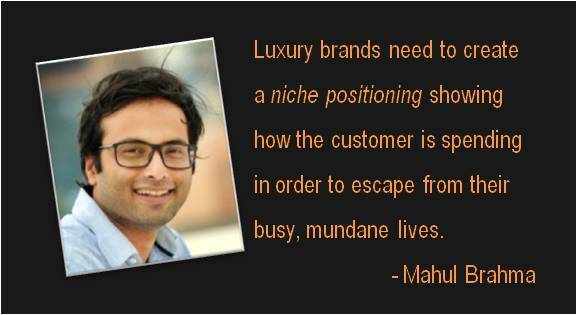 I felt the need to pen my book Decoding Luxe that captures the essence of luxury so that luxury is simplified and more and more brands can make money from this great market. This is doomed for failure. We need to look at the origin of luxury in these two countries to better understand why these are so intrinsically different markets. China is new money and the customers are the high-income youth who are happy to splurge on luxury. The story of China and luxury does not have a rich past like India’s. Let’s take a sneak peek into the age-old love affair between branded luxury and our great nation of Royalty. In the 1920s, 20 per cent of Rolls Royce’s global sales were from India. In 1926, the Maharaja of Patiala commissioned Cartier, its largest till date, to remodel his crown jewels, which included the 234.69 carat De Beers diamond. The result was a breath-taking Patiala necklace weighing 962.25 carats with 2,930 diamonds. In 1928, the Maharaja of Jammu and Kashmir placed orders for custom-made 30 trunks from luggage maker Louis Vuitton over a period of six months. Not to mention that a certain Nizam had procured 50 Harley Davidsons for his postmen to deliver his messages. Unless luxury brands have a perspective of how the relationships have been evolving on ages, how will they know what works best for us today and where to put the money? These brands are not new to us and at one point we were its biggest customers. The Chinese market was not there in the scene then. Moreover, with the ebbing Chinese luxury story, most luxury goods providers are shifting focus to the growing luxury consumer base in India, which is poised to grow at 25% from 2013 till 2018, and is likely to touch $18-billion mark from the ongoing level of $14 billion. It is time to bust the myth. Luxury brands need to focus on India independently and understand the Indian market – its uniqueness, its challenges and its billion-dollar opportunities. This is an age-old myth and most luxury brands spend millions of dollars in advertising to cash in on the “flaunt quotient” for their brands. In their mad rush to get attention of these flaunters, they have overlooked a billion-dollar opportunity. Luxury, in its various forms, acts as a great escape. Luxury is a great partner for solitude. One escapes into luxury. Just like lawyers and politicians who only find time to dictate, secretly find solace in their collection of pens. They told me in their busy schedules they just don’t get any time for themselves, just themselves. So they secretly take out an hour, may be an odd one, and spend time with their collection. They write, they clean and they fill the ink of very interesting colours, “It is like meditation”. The story is very similar with watch and clock collectors. I call them timekeepers. I have watched them closely since my birth, secretly escaping into this luxury. My ancestral home has a great collection of antique luxury clocks and pocket watches. This was a collection that spans three generations. Both my grandfather and his father, when they were alive, and now my father, spend one hour just winding all the clocks that include the grandfather’s longcase, chimes and pocketwatches of the biggest brands, some date back to the late 1800s. This was their private time, a time of solitude, no one was to enter the clock room for that one hour. They never used to boast or even talk about their collection, it was very personal. The case is very similar with connoisseurs of say cigar, single malt and luxury/vintage cars. These are very personal and private escapades. This escapement has always been a very dominant, yet the hidden reason behind the love for luxury. The only difference is that brand custodians never looked at this avenue with a magnifying glass. This escapade, if properly harnessed is the next billion-dollar-churner for all luxury brands across the globe. They just need to re-calibrate the positioning. Instead of positioning a brand only meant for flaunting where a customer will spend millions of dollars to show off, create a niche positioning of the brand as a great escape where consumers will be spending an even higher amount to buy an escape from their busy and mundane lives where they do not have any personal time, just for themselves. They will pay top-dollar for that one hour a week, or that lazy private beach or yacht holiday, away from everyone, where the brand will be the lone companion to their luxury solitude. Re-calibrate your positioning: Conceive branding opportunities wherein you sell solitude. However, the solitude should be very special. Always remember it is a luxury solitude, so the escape needs to be exquisite, say a private island. Align your communications with the target: The advertisements or posters will not have “neighbour’s envy owner’s pride theme”. It needs to have “spending quality time with oneself and with the brand.” It needs to be very subtle and very personal. So all the communications and creatives will fall in line with the idea of luxury escape, luxury solitude. Never exclude: Men with means are the same people who also love to flaunt in some other aspects which involve their family or their peers. And these are the same men who also seek expensive escapements for themselves. So never exclude one segment for another. So never say flaunters are bad or the other way round. Always remember, every segment has its own class. Diversify your brand line: The brand line needs to include products that cater to all kinds of buyers. Select and segregate very carefully which is best for solitude and which is best for flaunting. Mint the moolah: As the solitude partner is an untapped and unorganised space where brand custodians have not given much attention to, this is the time to go for it and make the moolah. Just escaping into luxury can make the brands richer by billions. It is time for Decoding Luxe and making it simple. Let your quest for luxury continue.